Broadcast connectivity expert SIS LIVE is to provide Ultra High Definition fibre connectivity for Sky Sports Ultra HD coverage of the English Premier League on Sky's premium platform Sky Q. The announcement follows months of collaboration between SIS LIVE and Sky Sports to ensure viewers receive live coverage in the highest possible picture quality. From the start of the 2016-17 Premier League football season on 13 August, SIS LIVE will utilise its Anylive fibre network to deliver Ultra HD pictures for 124 games covered by Sky Sports. The managed fibre connection (up to 850 Mbit/s) will use SIS LIVE’s fibre infrastructure, connecting every Premier League ground to SIS LIVE’s network operation centres in MediaCityUK and Milton Keynes, in addition to Sky Sports studios. HD reverse vision feeds will be delivered as part of the service, and SIS LIVE is providing Sky Sports with network control on match days by installing Net Insight’s Nimbra Touch and Switch technology at Sky Sports studios. Ahead of the first publicly available UHD football matches from Sky, SIS LIVE’s technical teams have collaborated with Sky Sports for several months, testing the technology to transmit high resolution 4K pictures (which quadruple the number of pixels in a full HD picture) via its extensive fibre network. “Sky Sport’s decision to use SIS LIVE’s Anylive fibre network to deliver their new, high profile channel means that we are well on the way to being recognized as the critical connectivity provider of choice." 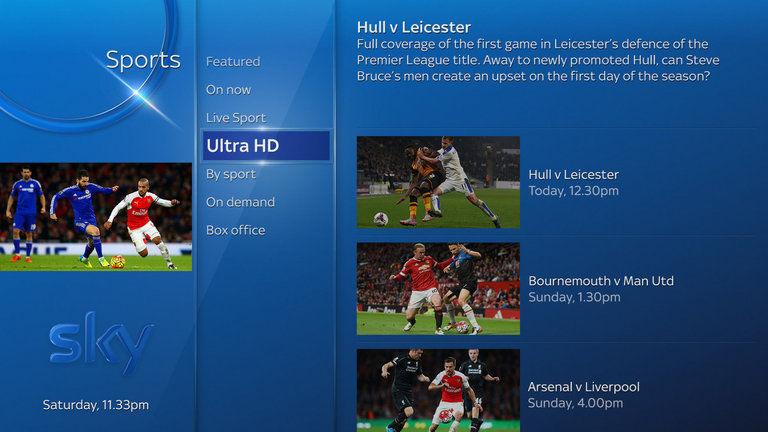 Sky Ultra HD launches 13th August with live sport, drama, movies and documentaries, only available on Sky Q.